Not too long ago my friend, Tom from RootJunky, revealed a method that allowed people to bypass Factory Reset Protection on Samsung devices. Tom couldn’t sit still for very long and decided it was time to show us another method he uncovered that would allow users to bypass Factory Reset Protection on LG and Nexus devices. 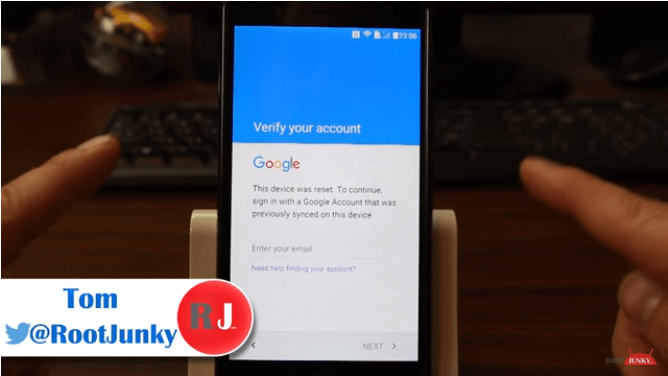 Factory Reset Protection is a newer feature from Google that helps protect your device in the event it is lost or stolen. In theory if someone takes your phone and forces a factory reset through recovery mode it would prevent the device from being activated without your Google account being the account to activate it. In practice this is a useful feature and is a good feature to have. There are however instances where a feature like this can cause issues and even a little bit of grief for legitimate users. Right before Thanksgiving I had an issue where someone on the other side of the world decided to try hacking into my Gmail account. Google locked my Gmail account to protect me and my data and then required me to change my password. Unfortunately I wasn’t aware all of this was going down and was in the middle of flashing a new custom ROM to my Nexus 5X. Factory Reset Protection kicked in and in a normal circumstance would have prevented other users from activating it but would have allowed me in. I was finally able to figure out what was going on but then I discovered another of Google’s protections, they won’t let you activate a device in Factory Reset Protection mode with an account that has had the password changed until 20 days after the password was changed… I wished I had had these bypass methods then. Check out both videos below to see how Tom does it. While you’re at it make sure and give him a thumbs up and subscribe to his channel. He’s a good one to follow! Final Fantasy 9 Coming to Android in 2016!